Pudong International Airport faces the East China Sea. It is about 30 kilometers from downtown Shanghai, and occupies an area of about 32 square kilometers. The whole project took the two years to complete. The construction area of the main building of Pudong International Airport is about 278,000 square meters. What is truly spectacular about this building is that its shape is that of an extremely big mew stretching its wings to soar above the sea. Pudong International Airport can provide landing service for 36 aircrafts simultaneously. In addition, even the largest commercial aircraft in the world can be handled by this immense airport. Pudong International Airport is the only airport in the world that allows visitors to enter the conning tower. 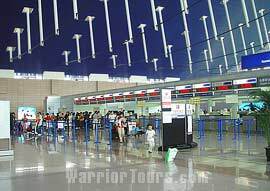 The openness and sublime mightiness have made this international airport one of the top scenic attractions of Shanghai. Stepping onto the observation deck on the sixth floor of the conning tower, you get a panoramic view of the arrivals and departures building, the runway and a selection of planes on parking apron. Meanwhile you have the chance to witness airliners' take-off and land with engines roaring. You rarely see this spectacular scene at any other airport. This is one of the finest airport of the world.